Realistic simulations of the ocean surface based on statistical wave models typically rely on very large Fourier grids. Real-time requirements severely limit the size of the grids that can be used, even if the FFT is implemented on the GPU. Moreover, none of the grids used so far are sufficient for capturing the entire dynamic range of ocean waves, which can easily span four to five orders of magnitude. Our approach removes the FFT as the computational bottleneck of sea surface simulations. By splitting the wave number range into a small number of non-overlapping, relatively narrow bands within which the samples are equidistantly spaced allows making use of the FFT while having some of the flexibility of the adaptive approaches that concentrate wave number samples in high-energy regions of the spectrum. 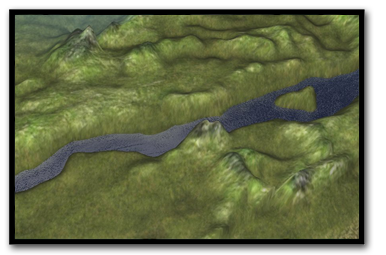 In this work we present a new method for the realistic real-time simulation of rivers. Our solution includes a 2D fluid solver that simulates the flow of a river's surface, an efficient method for adaptively computing 3D flow information and an animated 3D procedural wave texture that is advected through the fluid via advection particles in order to mimic the highly detailed fluid surfaces that are characteristic of rivers. Our technique that couples animated texture advection with a pseudo-3D fluid simulation produces stable results that are representative of large scale real-world rivers and suitable for use in real-time applications. Our system surpasses prior work on real-time river rendering both with regards to efficiency and visual quality, which we establish through the rendering of rivers tens of kilometers long. With the advent of ever-cheaper genome sequencing technologies, a wide range of organisms can now be examined at the genetic level, and biodiversity can be expressed in quantitative terms of genetic similarity and shared function. These techniques are now being applied to samples collected directly from the environment to give a cross-section of the diversity that exists at different locations in different habitats. We are developing an open source, 3D geospatial information system to examine and test relationships between biodiversity, geography, and the environment. The goal is to acquire cartographic and environmental data from many sources, and overlay user-provided genomic sample sites and genetic sequences. NetFlow data is being accumulated from the borders between private networks and the public internet. The data aggregate grows at the rate of gigabytes per day, stored in SiLK repositories. While tools exist to look for known malicious activities such as scanning, the volume of the data, its volatility, and the difficulty of establishing its “ground truth” preclude the use of conventional anomaly detection approaches for detecting malicious activity. To aid analysts in understanding this data, we are developing a comprehensive and extensible set of visualization tools, integrated with the SiLK tool suite via a relational database that stores data such as sets and multisets (“bags”), derived from NetFlow and similar sources. We physically relate to our environment in three dimensions. However, familiar modes of interaction reside in 2D, which mimic our interactions with traditional paper-based media. In this work, our aim is to combine the situational understanding that can be gained from 3D GIS, with familiar paper-based interaction. 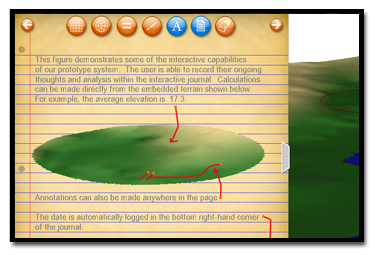 Our system situates 3D terrains within a metaphor of a 2D interactive scrapbook or journal. This allows the geospatial professional to maintain 3D records of their analysis over time and perform calculations directly over extracted terrain regions. In addition, the system would be useful as a teaching aid imparting an understanding of the third dimension. 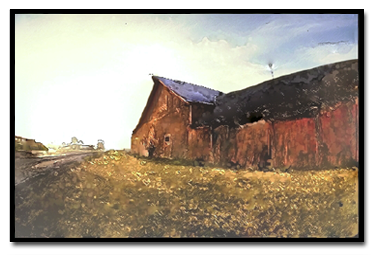 This work presents a technique to transform digital images into renderings that approximate the appearance of mixed media artwork, which incorporates two or more traditional visual media. This is achieved this by first separating an input image into distinct regions based on the detail present in the image. Each region is then processed independently with a user-selected NPR filter. This allows the user to treat highly detailed regions differently from regions of low frequency content. The separately processed regions are then blended in the gradient domain. In addition, the work is extended to the rendering of mixed media portraits. Portraits pose unique challenges that we address with our method of segmentation, which is based on a composite of face detection and image detail. Our approach offers the user a great deal of flexibility over the end result, while at the same time requiring very little input. A stained glass window possesses a distinctive style partly due to the unique color ranges produced through the interaction of color enamels, glass and light. The imposition of lead calmes further separates the appearance of stained glass from other mediums. This project presents a method of re-styling an image so that it approximates the appearance of a work of stained glass. To this end, a novel approach has been developed which involves image warping, segmentation, querying, and colorization along with texture synthesis. In the method, a given input image is first segmented. Each segment is subsequently transformed to match real segments of stained glass queried from a database of image exemplars. By using real sources of stained glass, the method produces high quality results in this nascent area of non-photorealistic rendering. 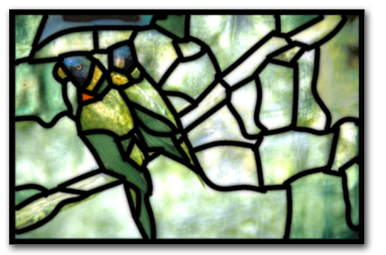 The generation of the stained glass requires only modest amounts of user interaction. This interaction is facilitated with a unique region-merging tool. 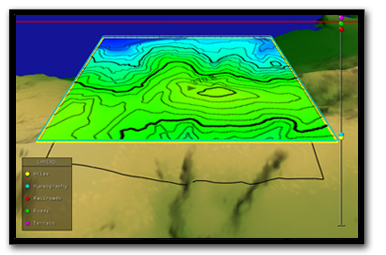 In many interactive computer graphics applications, maps in three dimensions are central to enabling the exploration, presentation and manipulation of geographical data. Advanced graphical libraries such as OpenGL enable efficient modelling and rendering of the third geographical dimension. In this project we are developing a unique Geographical Information System (GIS) that seamlessly integrates 2D and 3D views of the same spatial and aspatial data. Multiple layers of information are continuously transformed between the 2D and 3D modes under the control of the user, directly over a base-terrain. Although many existing commercial 3D GIS systems have 2D views they are typically isolated from the 3D view in that they are presented in a separate window. In this project we introduce a 2D/3D hybrid GIS that allows the user to view the 2D data in direct relation to the 3D view within the same view. Image editing software is often characterized by a seemingly endless array of toolbars, filters, transformations and layers. But recently, a counter trend has emerged in the field of image editing which aims to reduce the user’s workload through semi-automation. 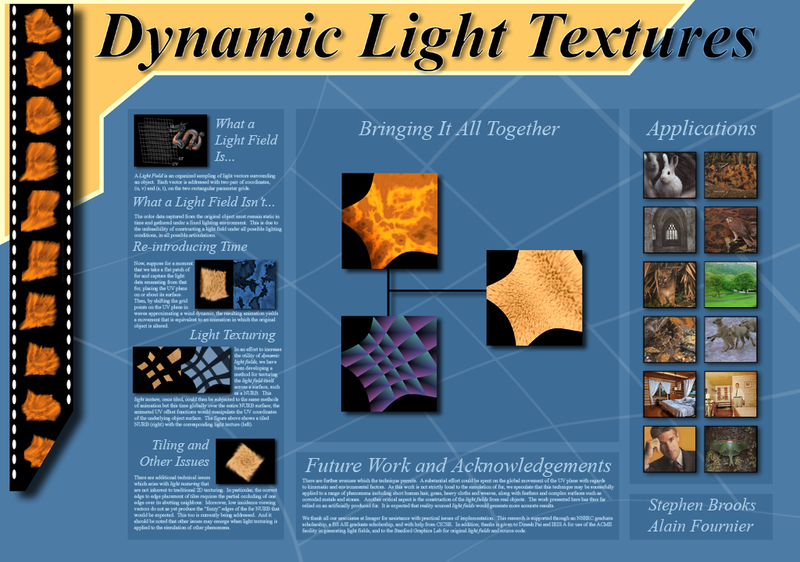 This alternate style of interaction has been made possible through advances in directed texture synthesis and computer vision. It is in this context that we have developed our texture editing system that allows complex operations to be performed on images with minimal user interaction. This is achieved by utilizing the inherent self-similarity of image textures to replicate intended manipulations globally. Our image editing approach includes operations for replicated painting, cloning and warping. The automatic generation of audio has been explored both as artifact in itself and for the accompaniment of existing animations. 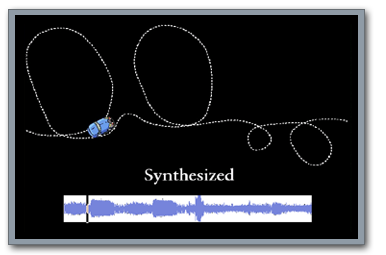 The most recent work automatically generates soundtracks for input animation based on existing animation soundtrack. This technique can greatly simplify the production of soundtracks in computer animation and video by re-targeting existing soundtracks. A segment of source audio is used to train a statistical model which is then used to generate variants of the original audio to fit particular constraints. These constraints can either be specified explicitly by the user in the form of large-scale properties of the sound texture, or determined automatically and semi-automatically by matching similar motion events in a source animation to those in the target animation. Earlier work explored connections between music and mathematics. MWSCCS is a concurrent stochastic process algebra for musical modeling and generative composition. This allows the creation music directly from mathematical processes. Two research projects have been undertaken in the area of motion editing. The first is a framework for synchronising motion curves to music in computer animation. Motions are locally modified using perceptual cues extracted from the music. The key to this approach is the use of standard music analysis techniques on complementary MIDI and audio representations of the same soundtrack. 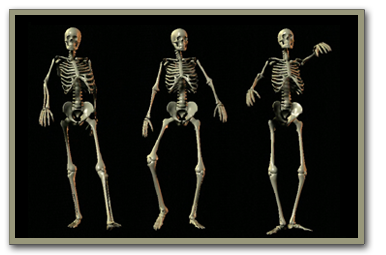 The second project allows the replicated editing of human movement contained in a motion capture sequence or database of sequences. To this end, we rapidly retrieve perceptually similar occurrences of a particular motion in a long motion capture sequence or unstructured motion capture database. The user is then able to replicate editing operations with minimal input: one or more editing operations on a given motion are made to affect all similar matching motions. New video added! I am always keen on talking with new students. If you are interested in doing a thesis (PhD, Master's or Honor's) or a directed studies in the areas of computer graphics, animation or visualization then feel free to drop by or send me an email to discuss it. I have a number of projects on the go and would be interested in supervising students with some level of experience with animation, graphics, image processing or visualization (i.e. having taken a course in any of these topics would be fine). Topic: High Dynamic Range Imaging. Topic: Visual Analytics for Aquaculture. Topic: Objective Quality Assessment Based Tone Mapping Optimization. Topic: Visual analytics for business data. Julia Weber, CALDO Undergraduate Internship. Herbenio Junior, CALDO Undergraduate Internship. Topic: Automated Analysis of User Study Video. Topic: Video Data Exploration for Film Production and User Study Analysis. Topic: Visualization of Network Data. Topic: Visualizing Geospatial Uncertainty in Marine Animal Tracks. Topic: Databurst: Interactive Analysis of Hierarchical Data Using Radial Space-Filling Diagrams. Rafael Falcon-Lins, Part-time MCS Thesis. Topic: Feature-Based Mesh Simplification with Quadric Error Metric Using A Line Simplification Algorithm. Topic: Simulating Wetland Ecosystems Through Grammar Based Plant Creation, Tool Assisted Terrain Design And Dynamic Distribution of Plant Species. Jessie Xin Zhang, PhD Thesis. Topic: Audio Segmentation, Classification and Visualization. Topic: Tone Mapping By Interactive Evolution. Topic: FloVis: A Network Security Visualization Framework. 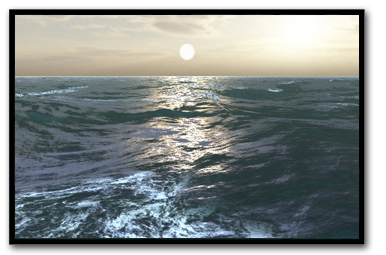 Topic: Real-time Ocean Surface Simulation. Andrew Shouldice, NSERC USRA, Summer 2008. Topic: Physical Simulation of Ocean Water. Graham LeBlanc, NSERC USRA, Summer 2008. Devin Horsman, NSERC USRA, Summer 2008. Jacqueline L. Whalley, visiting researcher on sabbatical for 6 months, 2008. From Auckland University of Technology. Suwen Wang, full-time research assistant, 2007-2008. Dalhousie University. Harman Clair, full-time research assistant, 2007-2008. Dalhousie University. Mark Dennis, Honors Thesis, 2008. Marcelo Ruetalo, MACS Thesis, 2007. Michael Welsman-Dinelle, Honors Thesis, 2007. Topic: Interactive Gradient Domain Texture Blending. Suwen Wang, Honors Thesis, 2007. 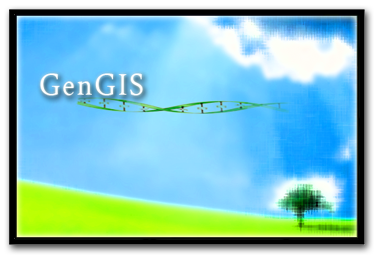 Topic: Collapsable 3D GIS Visualization. Steven Avery, Directed Studies, 2006. Topic: A Viewer and Podcaster for Digital Artwork. Andrew Pahuru, Joint Final Year Project, 2005. David Shorter, Joint Final Year Project, 2005. George Harker, Honors Thesis, 2003. Topic: Efficient and Believable Tree Motion. Jason Thomson, Honors Thesis, 2003. Topic: 3D Accelerated User Interfaces. Karen Inglis, Honors Thesis, 2002. David Stimpson, Honors Thesis, 2002. Topic: Graphically Simulated Generation of Plant Life. Teryl Taylor, Stephen Brooks and John McHugh. NetBytes Viewer: An Entity-based Netflow Visualization Utility for Identifying Intrusive Behavior. In Goodall et al. (eds. ), Mathematics and Visualization (Proceedings of VizSEC), Springer-Verlag, August, 2008 (PDF). Lingbo Zou and Stephen Brooks. A Dynamic Approach for Visualizing Local and Global Information in Geo-Spatial Network Visualizations. To appear in GeoInformatica. Xiaoting Hong and Stephen Brooks. 3D Objects Clouds: Viewing Virtual Objects in Interactive Clouds. To appear in IEEE Transactions on Visualization and Computer Graphics. Raheleh Makki, Eder Carvalho, Axel J. Soto, Stephen Brooks, Maria Cristina Ferreira De Oliveira, Evangelos Milios, and Rosane Minghim. 2018. ATR-Vis: Visual and Interactive Information Retrieval for Parliamentary Discussions in Twitter. ACM Transactions on Knowledge Discovery from Data, 12, 1, Article 3 (February 2018), 33 pages. Kevin Gao, Stephen Brooks and Dirk Arnold. A Feature-based Quality Metric for Tone Mapped Images. ACM Transactions on Applied Perception, Volume 14 Issue 4, September 2017. Kevin Gao, Stephen Brooks and Dirk V. Arnold. Automated parameter tuning for tone mapping using visual saliency. Computer & Graphics, volume 52, pp. 171–180, November 2015. Graham LeBlanc, Andrew Shouldice, Dirk V. Arnold and Stephen Brooks. Multi-band Fourier synthesis of ocean waves. Journal of Graphics Tools, volume 16, issue 2, pp. 57-70, 2012. Anwar Alhenshiri, Stephen Brooks, Michael Shepherd and Carolyn Watters. Augmenting the Perception of Web Search Results. Journal of Information Studies, volume 3, issue 1, pp. 18-30, January, 2011. Tim Burrell, Dirk Arnold and Stephen Brooks. Advected River Textures. Computer Animation and Virtual Worlds, volume 20, issue 2-3, pp. 163-173, June, 2009. Stephen Brooks and Brian J Ross. Automated Composition from Computer Models of Biological Behavior. Leonardo Music Journal, Volume 6, pp. 27-31, 1996. Mohamad H. Salimian, Derek F. Reilly, Stephen Brooks. IMRCE: A Unity Toolkit for Immersive Mixed Presence. To appear in ACM Spatial User Interaction, 2018. A.J. Soto, C. Ryan, F. Peña Silva, T. Das, J. Wołkowicz, E. Milios, S. Brooks. "Data Quality Challenges in Twitter Content Analysis for Informing Policy Making in Health Care". System Sciences, 760-769. January 2-6, 2018, Waikoloa, USA. Kevin Gao, Jeremy Porter, Stephen Brooks and Dirk V. Arnold. Evolutionary Optimization of Tone Mapped Image Quality Index. EA 2017: Artificial Evolution, pp 176-188, 2017. Kevin Gao, Stephen Brooks and Dirk Arnold. A Feature-based Quality Metric for Tone Mapped Images. ACM Symposium on Applied Perception, Cottbus, Germany, September, 2017. Mohamad H. Salimian, Derek F. Reilly, Stephen Brooks and Bonnie MacKay. Physical-Digital Privacy Interfaces for Mixed Reality Collaboration: An Exploratory Study. ACM International Conference on Interactive Surfaces and Spaces, pp. 261-270, Niagara Falls, Ontario, 2016. Raheleh Makki, Axel J. Soto, Stephen Brooks and Evangelos E. Milios. Twitter Message Recommendation Based on User Interest Profiles. IEEE/ACM International Conference on Advances in Social Networks Analysis and Mining, 18-21, Calgary, Alberta, 2016. Kevin Gao, Stephen Brooks and Dirk Arnold. Automatic Blended Tone Mapping through Evolutionary Optimization. IEEE Computational Intelligence, pp. 3855-3862, Vancouver, 2016. Zezi Ai, Kirstie Hawkey and Stephen Brooks. Scale-based Exploded View: Evaluating Object Selection Methods on Mobile Devices. ACM HotMobile, pp. 27-32, St. Augustine, February, 2016. Raheleh Makki, Axel J. Soto, Stephen Brooks and Evangelos E. Milios. Active Information Retrieval for Linking Twitter Posts with Political Debates. 14th IEEE Conference on Machine Learning and Applications, pp. 238-245, Miami, December, 2015. Kevin Gao, Dirk Arnold and Stephen Brooks. Saliency-based Parameter Tuning for Tone Mapping. To appear in the 11th European Conference for Visual Media Production, pp. 33-41, London, November, 2014. Mohamad Salimian, Derek Reilly, Stephen Brooks and Bonnie Mackay. Bridging physical and virtual privacy mechanisms during mixed-presence collaboration: implications for inconspicuous privacy. ACM SIGCHI Workshop on Inconspicuous Interaction , pp. 5-9, Toronto, April, 2014. Raheleh Makki, Evangelos E. Milios, and Stephen Brooks. Context-Specific Sentiment Lexicon Expansion via Minimal User Interaction. Information Visualization Theory and Applications, pp. 178-186, Lisbon, Portugal, 2014. Kevin Gao, Dirk Arnold and Stephen Brooks. Virtual Photograph based Saliency Analysis on High Dynamic Range Images. ACM Conference on Computational Aesthetics, pp. 87-92, Anaheim, California, July, 2013. Mohammad Salimian, Derek Reilly and Stephen Brooks. Geo-Collages: Visualizing News over Geographical Maps. ACM SIGSPATIAL Workshop on GeoStreaming, pp. 58-65, Orlando, Florida, November, 2013. Jake Seigel, Kirstie Hawkey and Stephen Brooks. Interview Explorer: A Lightweight Approach to Locating Interview Responses in Raw Data. Multimedia and Human Computer Interaction, pp. 185-192, Toronto, Canada, July, 2013. Mohammad Salimian, Derek Reilly and Stephen Brooks. Evaluating the Effects of Image Density and Regional Familiarity on Interaction with Collage-Based News Maps. ACM SIGSPATIAL Workshop on Map Interaction, pp. 24-29, Orlando, Florida, November, 2013. Matt MacDonald, Carrie Gates, Teryl Taylor, Diana Paterson and Stephen Brooks. Stability Visualizations as a Low-Complexity Descriptor of Network Host Behaviour. Ambient and Mobile Systems, pp. 84-91, Halifax, Canada, June, 2013. Derek Reilly, Mohammad Salimian, and Stephen Brooks. Document-Centric Mixed Reality and Informal Communication in a Brazilian Neurological Institution. ACM Conference on Computer Supported Cooperative Work and Social Computing (Workshop on Informal Communication in Health Practices), pp. 45-49, February, San Antonio, 2013. Jake Seigel, Sam Fisher, Stephen Brooks. Towards a Unified System for Digital Film Production. To appear in Proceedings of the 10th International Conference on Entertainment Computing, pp 149-154 Vancouver, Canada, October, 2011. Joel Glanfield, Diana Paterson, Christopher Smith, Teryl Taylor, Stephen Brooks, Carrie Gates, and John McHugh. 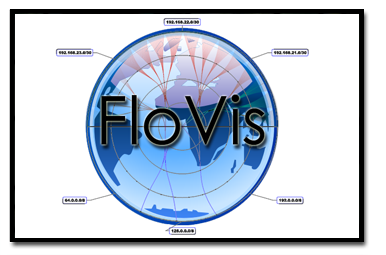 FloVis: Leveraging Visualization to Protect Sensitive Network Infrastructure. NATO Information Systems Technology Panel Symposium on Information Assurance and Cyber Defense. Tallinn, Estonia. November 22-23, 2010. Anwar Alhenshiri, Stephen Brooks, and Carolyn Watters. Augmenting the Perception of Web Search Results. International Conference on Digital Information Management (ICDIM 2010), Thunder Bay, Canada, July, 2010. Stephen Brooks. Movie Posters from Video by Example. Computational Aesthetics 2009, Victoria, British Columbia, May, 2009. Jessie Zhang, Jacqueline L. Whalley and Stephen Brooks. Time Mosaics - An Image Processing Approach to Audio Visualization. The 11th International Conference on Digital Audio Effects, Espoo, Finland, pp. 273-280, September, 2008. Suwen Wang and Stephen Brooks. A 3D Scrapbook Approach to Geospatial Analysis. The 12th Annual Geographical Information Science Research Conference, Manchester, pp. 200-205, April, 2008 (PDF). Suwen Wang, Robert Beiko and Stephen Brooks. Collapsible 3D Terrains for GIS Visualization. Proceedings of Geocomputation 2007, UK, Maynooth, September, 2007 (PDF). Stephen Brooks and Jacqueline L. Whalley. Towards a Comprehensive Multi-layer Hybrid Display of GIS Data. In Proceedings of the 11th Annual Geographical Information Science Research Conference, UK, Maynooth, pp. 215-219, April 2007. Stephen Brooks. Synthesis and Modification of Remotely Sensed Imagery. In Proceedings of the 11th Annual Geographical Information Science Research Conference, UK, Maynooth, pp. 178-182, April 2007. Stephen Brooks and Jacqueline L. Whalley. Visualizing Collapsible 3D Data in a Hybrid GIS. In Proceedings of Computer Graphics Theory and Applications ‘07, Barcelona, pp. 171-178, March, 2007. Stephen Brooks, Ian Saunders and Neil A. Dodgson. Image Compression Using Sparse Colour Sampling Combined with Non-linear Image Processing. In Proceedings of the 19th Symposium on Electronic Imaging, San Jose, pp. 1-12, January 2007 (PDF). Stephen Brooks and Neil A. Dodgson. Integrating Procedural Textures with Replicated Image Editing. In Proceedings of ACM GRAPHITE, Dunedin, pp. 277-280, December 2005 (PDF). Stephen Brooks and Jacqueline L. Whalley. A 2D/3D Hybrid Geographical Information System. In Proceedings of ACM GRAPHITE, Dunedin, pp. 323-330, December 2005 (PDF). Stephen Brooks, Marc Cardle and Neil A. Dodgson. 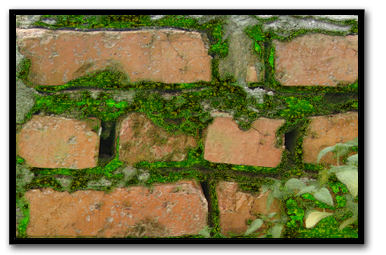 Enhanced Texture Editing using Self-Similarity. In Proceedings of Vision, Video and Graphics, Bath, July 2003 (PDF). Marc Cardle, Stephen Brooks, Ziv Bar-Joseph and Peter Robinson. Sound-by-Numbers: Motion-Driven Sound Synthesis. In Proceedings of the ACM SIGGRAPH Symposium on Computer Animation, San Diego, July 2003 (PDF). Marc Cardle, Stephen Brooks and Peter Robinson. Audio and User Directed Sound Synthesis. In Proceedings of the International Computer Music Conference (ICMC 2003), Singapore, October 2003 (PDF). Marc Cardle, Stephen Brooks and Peter Robinson. Directed Sound Synthesis with Natural Grains. In Proceedings of the Cambridge Music Processing Colloquium 2003 (CMPC 2003), Cambridge, March 2003. Marc Cardle, Loic Barthe, Stephen Brooks and Peter Robinson. Motion Transformations Guided by Music Analysis. In Proceedings of Eurographics UK 2002, Leicester, June 2002 (PDF). Teryl Taylor, Matt MacDonald, Joel Glanfield, Diana Paterson, Stephen Brooks, Carrie Gates, and John McHugh. FloVis: A Visualization Suite. Flocon 2011, Salt Lake City, Utah, January, 2011. Owen McCusker, Benjamin Gittins, Joel Glanfield, Scott Brunza and Stephen Brooks .The Need to Consider Both Object Identity and Behavior in Establishing the Trustworthiness of Network Devices within a Smart Grid. Cyber Security and Information Intelligence Research Workshop, Oak Ridge, Tennessee, April, 2010. Chris Smith, Stephen Brooks, Teryl Taylor, Diana Paterson, Joel Glanfield, Carrie Gates, and John McHugh. FlowBurst & FlowCal: Interactively Visualizing Network Security Data Using Radial Diagrams and Pattern Analysis. Flocon 2010, New Orleans, Louisiana, January, 2010. Diana Paterson, Teryl Taylor, Stephen Brooks, Joel Glanfield, Carrie Gates, and John McHugh. Activity Plots: A Multi-entity Time Series Visualization. Flocon 2009, Scottsdale, AZ, January, 2009. Teryl Taylor, Stephen Brooks, Joel Glanfield, Diana Paterson, Carrie Gates, and John McHugh. FLOVIS: A Netflow Visualization Tool. Flocon 2009, Scottsdale, AZ, January, 2009. Teryl Taylor, Stephen Brooks, Joel Glanfield, Diana Paterson, Carrie Gates, and John McHugh. 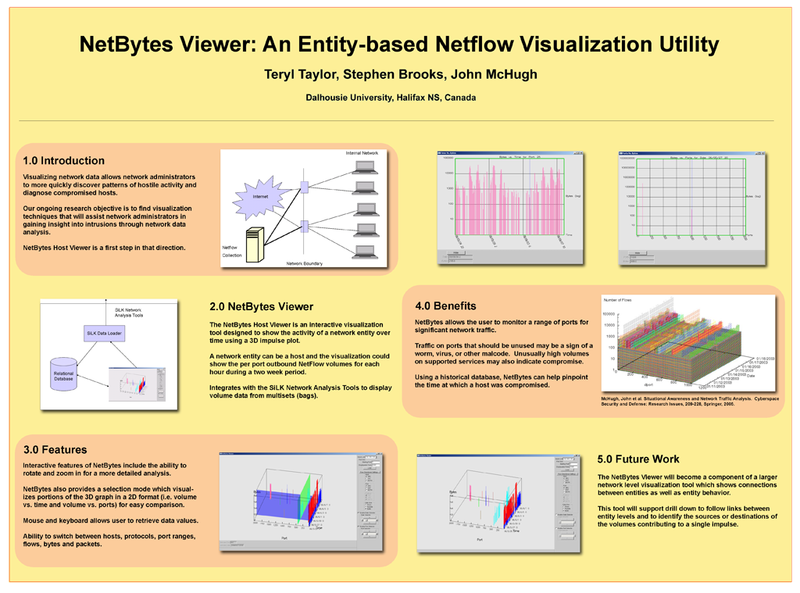 NetBytes Viewer: An Entity-based Visualization Tool. Flocon 2009, Scottsdale, AZ, January, 2009. Stephen Brooks, Marc Cardle and Neil A. Dodgson. Concise User Control for Texture-By-Numbers Cloning. In ACM SIGGRAPH 2003 Conference Abstracts and Applications, San Diego, July 2003. Marc Cardle, Michalis Vlachos, Stephen Brooks, Eamonn Keogh and Dimitrios Gunopulos. Fast Motion Capture Matching with Replicated Motion Editing. In ACM SIGGRAPH 2003 Conference Abstracts and Applications, San Diego, July 2003 (PDF). Marc Cardle, Stephen Brooks, Loic Barthe, Mohamed Hassan and Peter Robinson. Music-Driven Motion Editing. In ACM SIGGRAPH 2002 Conference Abstracts and Applications, San Antonio, July 2002. Stephen Brooks, Marc Cardle and Neil A. Dodgson. Replicated Texture Editing. Technical Report CS-2005-21, Faculty of Computer Science, Dalhousie University, Halifax, NS, Canada, November 2005 (PDF). Lingbo Zou and Stephen Brooks. Eye-opening: an Interactive Approach for Visualizing Connected Data. Graphics Interface 2015, Halifax, June, 2015. Xiaoting Hong and Stephen Brooks. Viewing 3D Objects in Interactive Clouds on Mobile Devices. Graphics Interface 2015, Halifax, June, 2015. Mohamad Salimian, Derek Reilly and Stephen Brooks. Exploring group awareness in a mixed reality collaborative environment. UbiComp, Osaka, September, 2015. Mohamad Salimian, Christopher Smith, Elaine Toms, Stephen Brooks. Geographic Wordles. GRAND, Vancouver, May, 2011. Diana Paterson, Joel Glanfield, Chris Smith, Teryl Taylor, Stephen Brooks, Carrie Gates and John McHugh. 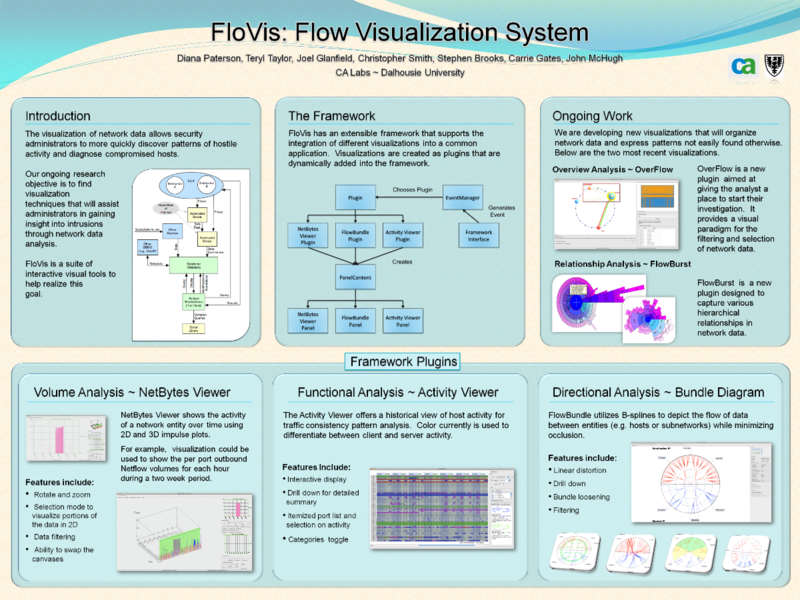 FloVis: Flow Visualization System. USENIX, Montreal, August, 2009 (Image). Robert G. Beiko, Suwen Wang, Sylvia Churcher, Greg Smolyn, Harman Clair, Christian Blouin, Jacquelyn Whalley and Stephen Brooks. 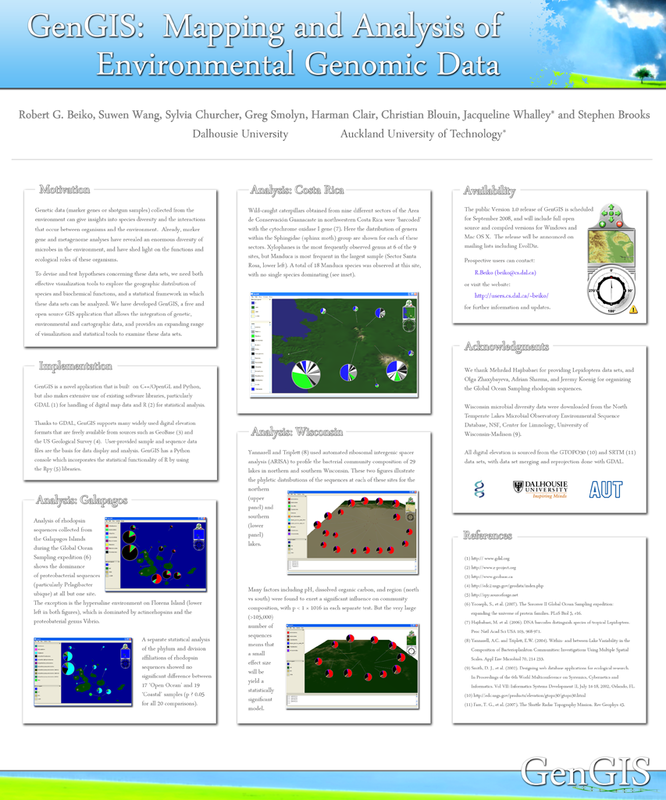 GenGIS: Mapping and Analysis of Environmental Genomic Data. Intelligent Systems in Molecular Biology (ISMB), Toronto, July 2008 (Image). Teryl Taylor, Stephen Brooks and John McHugh. An Entity-based Netflow Visualization Utility for Identifying Intrusive Behavior. Recent Advances in Intrusion Detection, Queensland, Australia, June 2007 (Image). Stephen Brooks and Alain Fournier. Dynamic Light Textures. Graphics Interface, Kingston, Canada, June 1999 (Image). Game Design and Development 4168 teaches students the fundamentals of digital game design with an emphasis on team-based development. In this course students will produce a significant game using techniques and principles derived from established state-of-the-art industry practices. Topics include an examination of game design theories, programming architectures, audio-visual design and game production. Visualization 4166/6406 is a co-listed 4th year undergraduate and graduate course that focuses on graphical techniques for data visualization that assist in the extraction of meaning from datasets. This involves the design and development of efficient tools for the exploration of large and often complex information domains. The course will cover all aspects of visualization including fundamental concepts, algorithms, data structures and the role of human perception. Computer Animation 3161 provides a comprehensive overview of algorithms and software techniques for generating animated movies and interactive animation programs. This course is aimed at computer science students interested in understanding the underlying concepts and techniques of computer animation. Through the development of a significant project using industry standard graphics libraries, students learn proven techniques of computer animation. Though not extensively mathematical, the course exposes students to mathematical concepts such as curve representations, numeric interpolation and parameterization where appropriate. Network Computing 3171 gives students a foundation in computer networks. It presents a top-down view of the layered architectural elements of communication systems, focusing on the Internet and TCP/IP. Topics include client/server systems, packet switching, protocol stacks, queuing theory, application protocols, socket programming, remote service calls, reliable transport, UDP, TCP, and security. Introduction to Computing 1200 is a class of technical computer literacy. Students can expect to learn about computers in a general way and how computers affect the way we live and work. Students will be given an opportunity to become familiar with typical applications of software such as word processors, spreadsheets and database applications. Other topics will include the use of the internet, creation of web pages, and simple programming concepts. No previous computer experience is required.